If the ground you're on seems to be shifting, consider our dramatic moment of astrology. Venus has just moved to direct motion; Mercury has just moved to retrograde motion. And two planets have mounted the mutable cross. If the ground you're on seems to be shifting, consider our dramatic moment of astrology. Venus has just moved to direct motion; Mercury has just moved to retrograde motion. And two planets have mounted the mutable cross: Mars has entered Pisces, after seemingly endless months traversing Aquarius, and Jupiter has entered Sagittarius. This is a sweeping change in environment, in contrast to what we've been accustomed to the past seven or eight months. I think that many of us are still picking up the pieces from Mars retrograde. Just about everyone I know went through something unusual, life-changing or destructive. Anyway, that is behind us, though I would encourage you to still keep doing any necessary repair and cleanup work. Right now, almost anything is available. Any potential is within reach, particularly if you do that Sagittarius thing and keep your focus on what you want. A lot of pent-up energy is going to be released with Mars in Pisces, after the long retrograde, and Mars somewhat out of sorts in Aquarius. It will be necessary under this astrology to keep a grip on your emotions, on your sense of wounding, issues of betrayal, and desire for revenge. There is a time for every purpose under heaven, and this is the time to be a little chill about all those things, call them what they are, and find appropriate ways to address each of them. The aspect to watch on this topic is Mars conjunct Nessus, exact Sunday, Nov. 25. But this will be a slow burn as it approaches. If you're getting together with a family where there has been a lot of abuse in years or generations past, this is a trigger warning. If this keeps happening, get yourself a copy of A General Theory of Love, so you understand what's going on. This is perfect astrology under which to get tweaked on matters of sexuality, so be aware of that, and be aware it may be coming from the distant past of someone else. Centaurs always point to ancestral material. Anyway, here in our new environment, we're about to have a dramatic moment: the Sun enters Sagittarius on Thursday, Thanksgiving Day in the United States, joining Jupiter in that sign. Then 24 hours or so later, the Moon enters Gemini and opposes the Sun, for the Gemini Full Moon. That's the chart I've used to write the horoscope below, by the way. The Full Moon is a grand cross (most astrologers would say a T-square, but I'll explain what I'm adding to make it a cross). The Moon in Gemini is opposite the Sun-Jupiter conjunction in Sagittarius; both are square Mars-Nessus conjunction in Pisces. That is a lot of mutable cross energy, considering that we had very little of the stuff in our environment at this time last week. So that accounts for the T-square, with points in Gemini, Sagittarius and Pisces. What about Virgo? First, there is Transpluto, a hypothetical point, which I've read was developed in the 1960s. It is a kind of synthesis of the orbits of Uranus, Neptune and Pluto -- the "modern planets" -- so it has some outer-planet energy. It takes about 75 years to go through one sign, and is currently in very early Virgo. Gradually I am getting a feel for Transpluto. (I find the hypotheticals challenging to delineate; there are nine of them, and I have not written much about them, but I look at them all the time and have for decades.) To this chart, I think it pulls some focus. 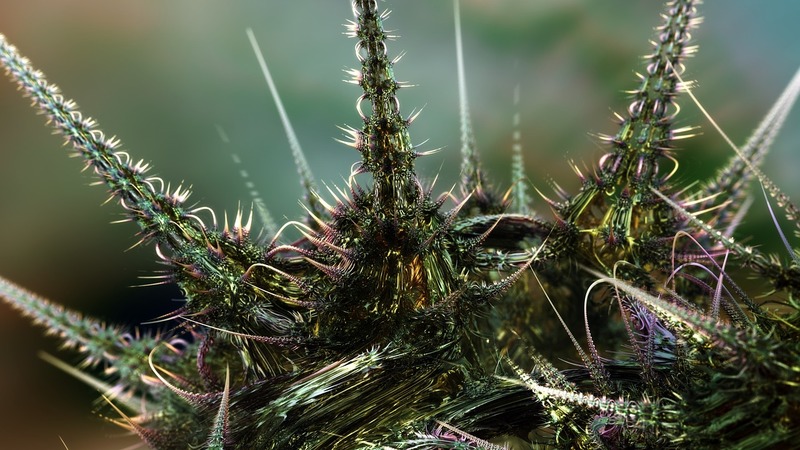 Transpluto can represent the holistic principle, and it can also represent "too much of a potent medicine" such as discipline or criticism. A conjunction shows up right near Transpluto: an odd asteroid called Apollo, and a short-period cometary centaur called Echelus, discovered in 2000. This makes it in a rare class of planets to be both centaur and comet, the first of which was Chiron. (There are just seven cross-listed comets and minor planets.) I have not worked much with this one; its discovery degree is 16+ Virgo, in an exact square to Chiron in Sagittarius. Whatever the details, this object will have a similar action to Chiron, the first centaur. Apollo is the easiest to grasp. It's about making the same mistakes over and over again. I think it's fair to say that this aspect pattern represents knowing what hurts you, and doing as little of it as possible, and as much of other things as possible. To have healing, to have happiness, to have anything, it's necessary to want it. And it's helpful if your wanting is not clouded with doubt or misgiving. Get that out of the way. Get real with yourself, and take up the full guidance of your life. You can do it. 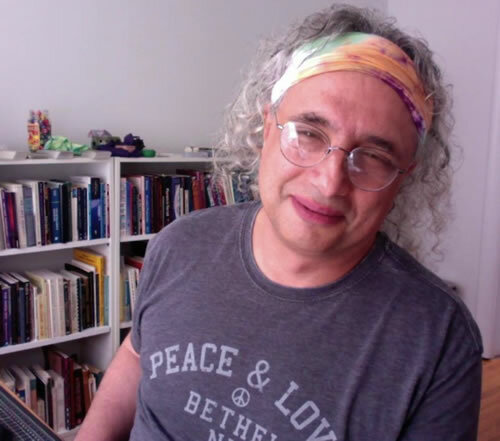 Planet Waves (ISSN 1933-9135) is published each Sunday and Thursday evening in Kingston, New York, Planet Waves, Inc. Core Community membership: $197/year. Editor and Publisher: Eric Francis Coppolino. Web Developer: Anatoly Ryzhenko. Astrology Editor: Amanda Painter. Client Services: Josie Coppolino, Amy Elliott and Victoria Emory. Finance: Andrew Slater. Technical Assistant: Emily Thing. Copy Editor and Fact Checker: Jessica Keet. Media Consultant: Andrew McLuhan. Music Director: Daniel Sternstein. Bass and Drums: Daniel Grimsland. Additional Research, Writing and Opinions: Yuko Katori, Cindy Tice Ragusa and Carol van Strum. The figure above is a sample of the inauguration chart for Donald Trump, the moment he became president. I've been staring at this chart every day for nearly two years; it's hanging on my studio bathroom wall. Slowly it's starting to make sense. Notice the cluster in Pisces. That's in the 11th house, the house of groups; all the planets are in Pisces, the sign of the public. The prior house, to the right, is the 10th -- the house of executive power. All year long, Mars has been dancing around the inauguration's 10th house, going back and forth over the Sun. 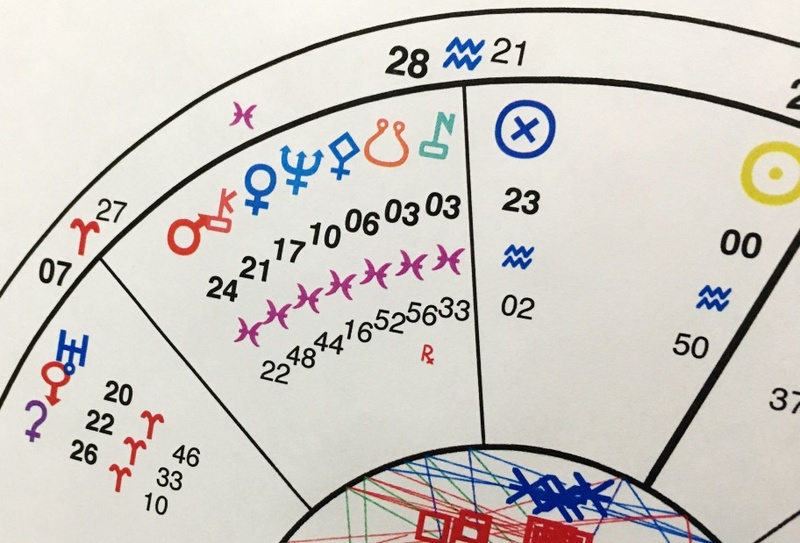 Last week, Mars made its way into Pisces, where it begins a new odyssey in this chart: making a series of conjunctions to all of the planets, and the South Node. 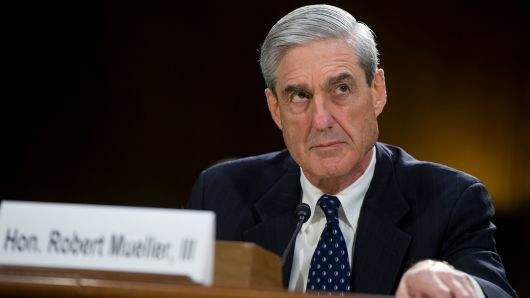 Robert J. Mueller III; photo by Tom Williams / CQ Roll Call. This coincides with the end of the election season, and the House of Representatives being taken over by the Democratic Party. With Mars passing through Pisces, we may have a power-to-the-people moment. It's also when Robert Mueller III, the special counsel investigating Russian interference with the 2016 election, is likely to make some of his biggest moves. Because there are many planets in this cluster, this is a story that will have many chapters. I've described some of the themes below; let's see which of them play out in real time and real life. The most interesting thing in this cluster is Nessus conjunct the South Node. This represents the kind of abuse legacy we've seen Trump dripping with, though the thing to bear in mind is that this is not new material. It's the "karmic" kind of old -- the South Node -- and the ancestral kind of old -- centaur Nessus. Nessus is not just about abuse; it's also about the violation of trust, it's about deception, and most significantly, it raises the question of "what really happened?" Nessus does not ascribe responsibility on its own; that must come out of the rest of the chart, and the fact pattern. And in any event, this chart points to the past, including the past of the population itself: that which has not been addressed, resolved, or spoken of honestly. Reading right to left, the next pair is Pallas (the diamond-shaped asteroid of law and polices) conjunct Neptune (deception, delusion, idealism). This represents the tendency of the American people to be ignorant of actual matters of law and politics. More troubling is that it represents the tendency to be susceptible to fraud, hucksters, and con men. Neptune is like a bubble people get trapped in, and we keep using the word "bubble" to describe the self-selecting way we get our so-called news. If you haven't noticed, a great many people believe only what they want to believe, regardless of the facts. Who do you know whose mind can be changed by new information? 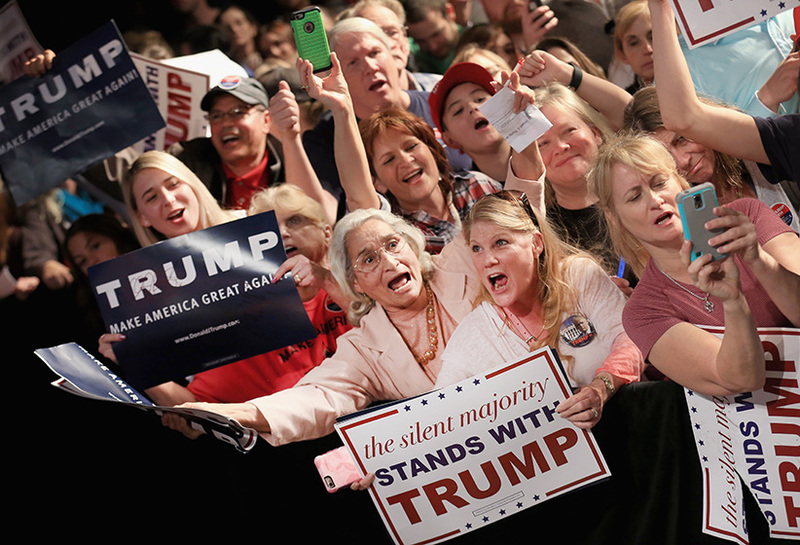 People eager for Trump's autograph at a Feb. 26, 2016 campaign rally in Fort Worth, Texas. Photo by Tom Pennington. Worse yet, Neptune is about glamour and image; it's the planet of illusion. For many in the U.S. right now, the political sphere is attractive because it's so glamorous, particularly the executive branch. It's bathed in this curious, glowing allure that makes it seem like something it's not. Those are the pep rallies reminiscent of 1938 Germany, with our Dear Leader blathering on about the American Way and terrifying Costa Rican refugees allegedly about to storm the border. Then is a triple conjunction of Venus, Mars and Chiron. Chiron has a way of amping up the sexual aspects of Venus and Mars. This comes in two flavors: either those inflicted with injuries that they don't attend to; or those who are in touch with the process of healing their injuries and who have harnessed that power as lovers and/or healers and/or teachers. Most of the situation in the United States is fueled by repressed, injured, struggling or demented sexuality, and that makes people susceptible to manipulation. I reckon that very few people have any idea that it's their sexual pain, loss or longing that leads to susceptibility to political manipulation. Mars leaves Pisces on New Year's Eve, so the series of conjunctions to this grouping will take the rest of the year. It will culminate with a Mars-Chiron mutual aspect (conjunction) on Dec. 29. Then Mars enters Aries, where it will contact the Aries Point and make a conjunction to (120347) Salacia. My current take on Salacia, a newly discovered dwarf planet candidate in the outer solar system, is that it represents the need to heal our obsession with the salacious aspects of sexuality and get mature about this most fundamental element of existence. This will not necessarily be a trend, though true to Aries Point style, there will be a few trailblazers, and then a few people will see the appeal in feeling better and letting go of the extreme burden of negativity about our own most basic nature. Part of that nature involves sexuality -- perhaps the deepest. Yet another involves our ability to organize ourselves as a society, and this takes commitment to truth, and commitment to our neighbors. There is no society in any meaningful form without the larger goals that transcend an individual life, and in some way pertain to all of us here. As you may know from scanning the astrology websites, 2020 promises to be quite a year -- and 2019 is preparation for those events. They include the Saturn-Pluto conjunction and the Jupiter-Saturn conjunction -- two world-changing aspects in one year. 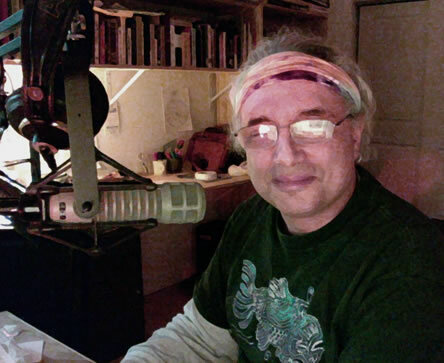 I'm getting ready to record and write the 21st annual edition of Planet Waves. I will be setting aside all but the most essential other work to write and record what amounts to an astrological radio serial and an astrological adventure novel. 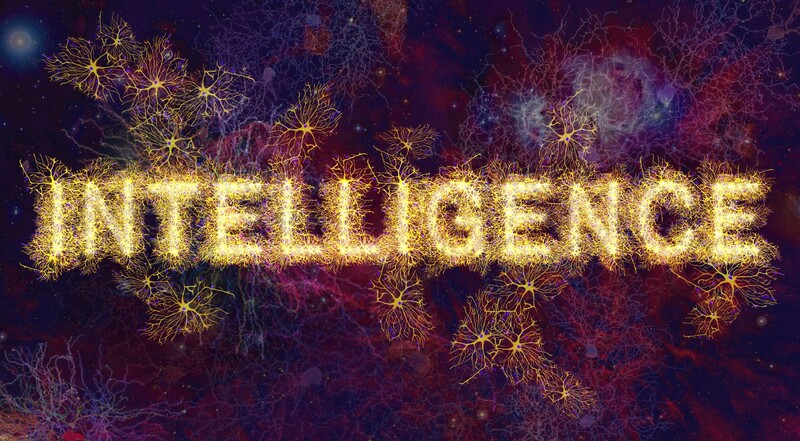 The 2019-2020 annual reading is called INTELLIGENCE. That's the one thing we need to make it through the global crisis, and for many, their individual crisis. It's the one thing we need to make the most of our lives. In that edition, I'll be looking at the astrology up to the Jupiter-Saturn conjunction of Dec. 21, 2020. In this edition I am returning to the format of audio and written, which I have not done for a couple of years. For the first time that I know of, I'm planning to have the audio format, called RESET 2019, ready by Dec. 31, in time for New Year's Day listening. Then the written portion, looking at 2019 and 2020, will be out some time in February. This is the last call for the combined 2019-2020 annual edition, including both years at one price, which is now $111. The audio readings include original music by Vision Quest. Soon, I will be splitting the two projects, and offering each separately for $88 or combined for $144. Individual sign sales for each year will begin at $44. So this offer is a significant discount on what promises to be a beautiful, helpful and reassuring astrology resource. "This note is just to let you know how wonderful I find your work -- intellectually and spiritually. Your Fall Empathy reading for Sagittarius was a like a x-ray to my soul." Jupiter has recently entered your sign for the next year. As wild and stressful as the world as been lately, Jupiter's arrival means you're entering a year of new experience, greater understanding of who you are, and inspiring growth. Eric at his writing desk. Chiron, the planet of healing, is associated with Sagittarius, and will be active in your chart this year -- making its entry into your fellow fire sign Aries. This transit is about finding your identity through creative experiences, and actively developing your ideas. It’s time for the true artist in you to emerge, and Eric’s reading will support you in this. What's more: as you take advantage of the benefits that may come your way, you have an opportunity to share your abundance to mutually benefit those you're engaging with. Jupiter is a key energy to work with actively to move your projects and plans forward. Maximize your year of Jupiter: pre-order your 2018 Sagittarius Astrology Studio (formerly the Birthday Reading) for the lowest price we offer: just $33 for two audio segments (at least 30 min each) and a tarot reading covering your next 12 months. The price of the reading increases as publication nears. "Like others have said, it feels personal to my life, even though you’ve interpreted the astrology off of a group chart. It’s awesome!" 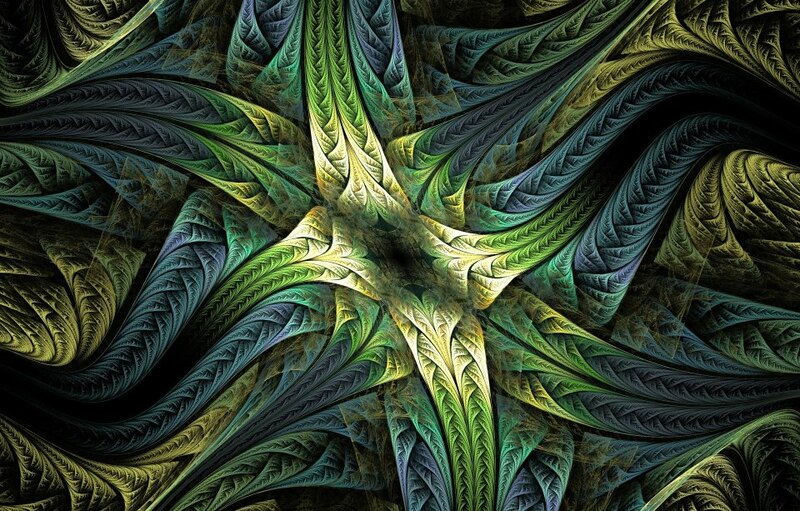 Note that Eric's audio readings offer significant insight for your Sun sign, rising sign and Moon sign -- and they make a unique gift for your Sagittarius loved ones. He keeps astro-jargon to a minimum, instead telling the story of your year in a way that is motivational, accessible, empowering and surprisingly personal. Planet Waves has an in-house music ensemble, called Vision Quest. We have a 38-hour loop of our music, which you can listen to any time. Included are finished pieces, rehearsals, live concerts, drum grooves, and spoken word recordings. I consider it a kind of musical divination. Click in randomly at different times of day and see what you discover. It took me a long time to figure out what kind of gift to offer for new and returning subscribers. Tee shirts seemed too complicated; you need at least six sizes to get started, and not everyone wants a shirt. Tote bags are useful but kind of boring. So I thought: journals. I love notebooks, and just about everything I write starts scribbled down on paper. I know my readers are a little old-fashioned, so this seemed like the perfect thing. Black smaller, pink larger, embossed with the Planet Waves logo. There are a few hand-painted sketchbooks left, with heavy, acid-free paper. Then...I researched embossed journals for about six months. That's how long it took. I requested or purchased samples of the best that suppliers had, and all kinds of stuff came floating in the door. It was more challenging than I imagined to find a nice one, though finally I did. Everything had to be right: the paper, the lines, and how the book feels in your hands. However, the one I selected was being discontinued. I ordered as many as we could reasonably afford. We now have two main options: small black ones, and larger pink ones (these are new). Together, they are the approximate color of Good & Plenty candy. I am one of these people who loves anything pink (sweatshirts, nail polish, headbands, a hot pink Squier guitar that I gave to Zosha a few years ago). We also have a few hand-painted notebooks left, which are acid-free sketchbooks. 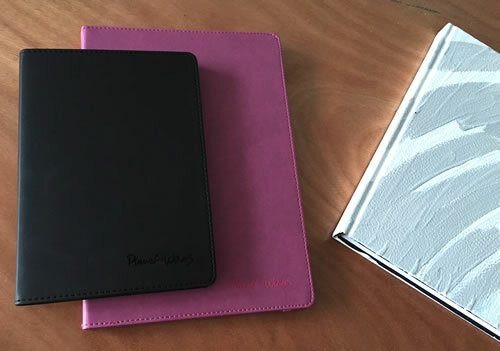 You can get an embossed notebook with any monthly, quarterly or yearly membership to Planet Waves. If, by the way, there's a calling for hand-painted ones, I will make one more-or-less to your preferences (for those who sign up for a full-year Backstage Pass). Continue reading this letter here. We published your extended monthly horoscopes for November on Wednesday, Nov. 7. Your extended monthly horoscopes for October were published on Tuesday, Oct. 11. Please note: we normally publish the extended monthly horoscope after the Sun has entered a new sign. 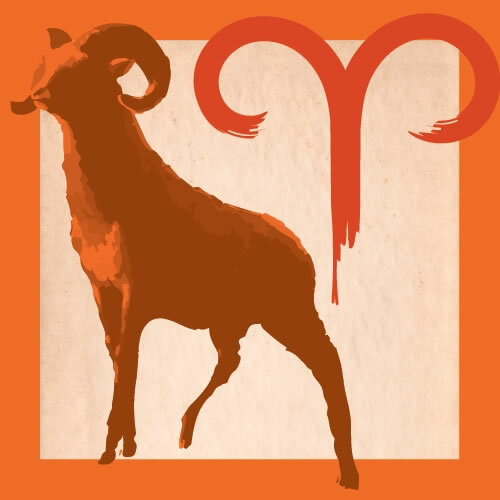 Aries (March 20-April 19) -- Your ruling planet Mars has finally found its way out of Aquarius and into Pisces. This will probably come as a relief, though you're now also moving into deeper emotional territory -- be prepared for that. Aquarius is an air sign; Pisces is a water sign. What may have seemed like an abstraction is now subject to being experienced as emotional and physical. That means going directly into the water rather than sailing on top of it. You may find yourself addressing subject matter that was much easier to avoid before, and I suggest you devote yourself to that directly. The thing to remember is that this really does not involve someone else, including if someone did something to you at some point in the past. The work is yours now; accountability does not exist outside yourself. This does not mean you are to blame; rather, it means that you are the one tasked with addressing your own healing process. That job belongs to you and nobody else. Get your full Aries reading by Eric here. 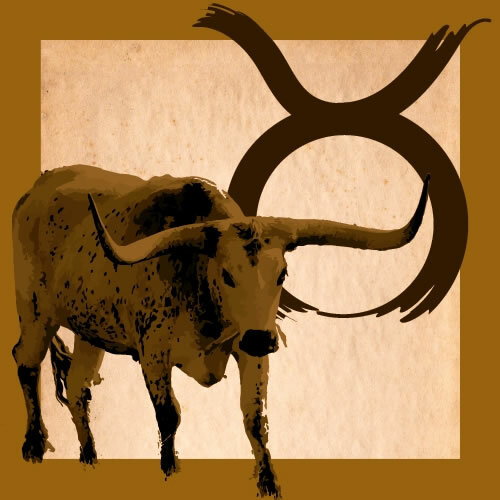 Taurus (April 19-May 20) -- You may experience some kind of financial windfall or benefit that comes through your association with someone else. Check carefully and make sure that there are no strings attached, or problems that have not been noted. For example, check into the intentions of people who are involved with someone close to you but who are one or two degrees of separation from you. Be alert to possible technological issues associated with banking and finance, and address them promptly and thoroughly if you find any -- documenting as you go. That means taking names and extensions during phone calls, getting email verification, printing those emails, and taking notes. You will need to verify facts and figures, and then check again in two weeks, and then two weeks after that. Mercury is retrograde, so that is your timing. Any matters you're trying to work out now will need some consistent attention through Dec. 24, when Mercury is square Neptune. Get your full Taurus reading by Eric here. 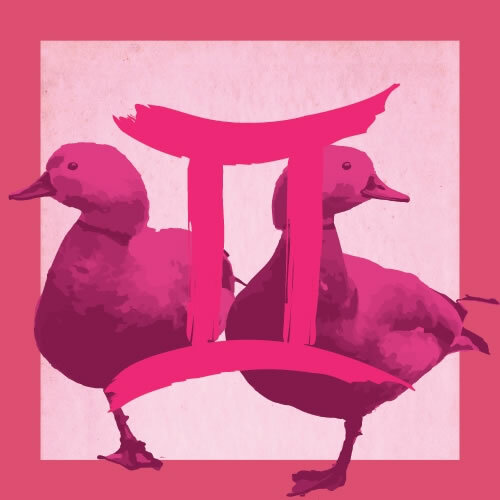 Gemini (May 20-June 21) -- Mercury has changed to retrograde motion, in a slippery aspect to Neptune. This is your reminder to take nothing for granted. Small matters might be much more important than they seem; what appear to be large matters might turn out to be trivial. So you will need to use your discernment and your perceptive abilities. Above all else, do not revert to superficial or lazy thinking habits of the past, but rather keep your focus, and penetrate beneath the appearances of things and get to the deeper truth. This is unlikely to happen overnight, though what you learned at the end of last week will provide valuable information, even though it may not seem like that at first. This can be a beneficial Mercury retrograde experience if you pay attention to your surroundings and the people you find there, in particular looking for opportunities to collaborate. That means mutually beneficial relationships, where you provide an essential ingredient. Get your full Gemini reading by Eric here. 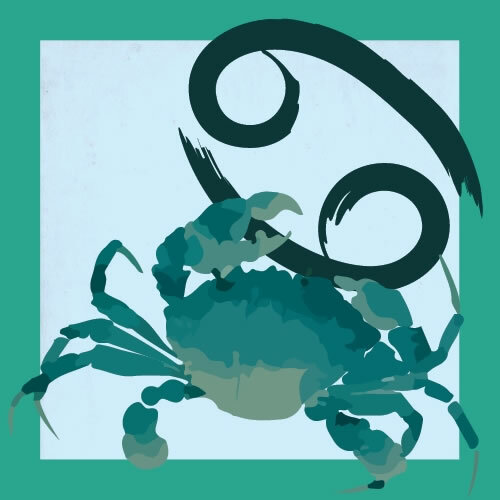 Cancer (June 21-July 22) -- If you have something work-related to get done by the end of the year, give it all the focus you can. While it may be impossible to set everything else aside, you can prioritize, and keep coming back to your number one mission as your primary focus every day. At least try to make some measurable progress on a daily basis. Progress might count as relatively little on any given day, perhaps a single idea that you take note of and begin to develop. The primary thing to track will be daily movement of some kind, and your efficiency. That includes making sure your time is structured, and that your structure is flexible. Be sensitive to when you're going adrift, and to factors that tend to blow you off course -- such as which people, which trivial tasks, and which personal tendencies you may have. For example, if going out to lunch breaks up your day, costing you productivity, then stay in. If you wake up earlier when you don't drink the night before, and you need to be up early, then don't drink. Get your full Cancer reading by Eric here. 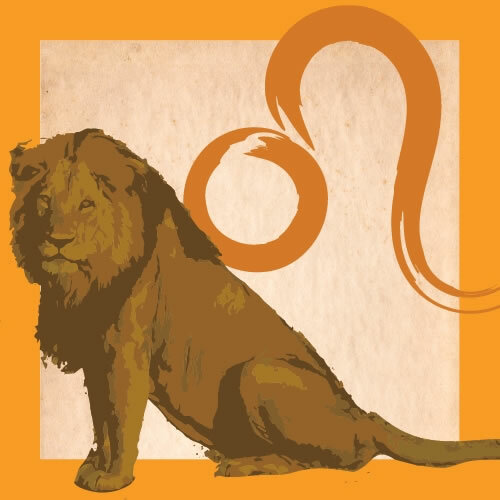 Leo (July 22-Aug. 23) -- There used to be an old expression that applied to people who are intimately involved -- working it out in bed. The idea is that conflict could be resolved through wholesome sexual contact, which can have a way of subverting conflict and disagreement. It helps if there is mutual love, since that's the source of the resolution, and the working out part comes down to the use of Mars: whether for desire, or aggression. What you want to be doing is converting any form of tension into something creative and mutually fulfilling. The tension is raw energy, which can transform into just about anything. Your role as a sentient being is to guide your energy into loving, constructive, helpful forms. So this could mean working it out in bed, or on the dance floor, or in your art studio, the martial arts studio, or on your drums. There's an energy surge coming with Friday's New Moon, and you can ride that wave to a positive place. Get your full Leo reading by Eric here. 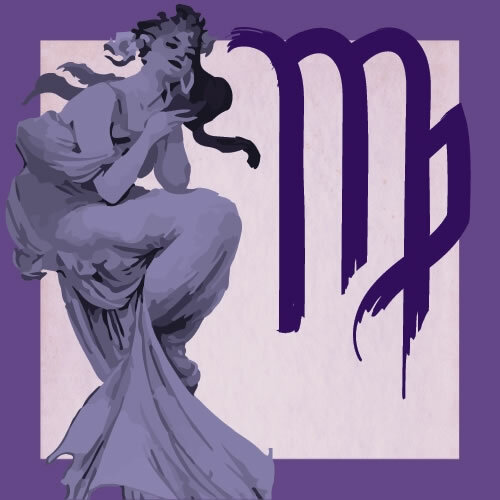 Virgo (Aug. 23-Sep. 22) -- All at once, the emphasis of the sky has shifted to the mutable cross, home of the sign Virgo. Mars has entered Pisces, Jupiter has entered Sagittarius, and Mercury has turned retrograde in Sagittarius. Then on Friday, there will be a Full Moon in Gemini. That's a whole bunch of mojo coming at you from all directions, which could be arriving with confusion, frustration, or a sense of being adrift. Think of all the factors I just mentioned as externals. On the internal level, there are two specific things you must be cautious of. One is the tendency to make the same mistakes over and over. If you notice yourself doing that, pause and figure out what is going on. Disarm any sources of self-sabotage, by recognizing that you want to be a productive force in your own life. Notice who you may be angry at, and voice your concerns in a way that is not alienating. Last, I would remind you of the service orientation of your sign, which is often one of the saving graces of the whole zodiac. You want to do the right thing; make sure you're doing it for the right reasons. Get your full Virgo reading by Eric here. 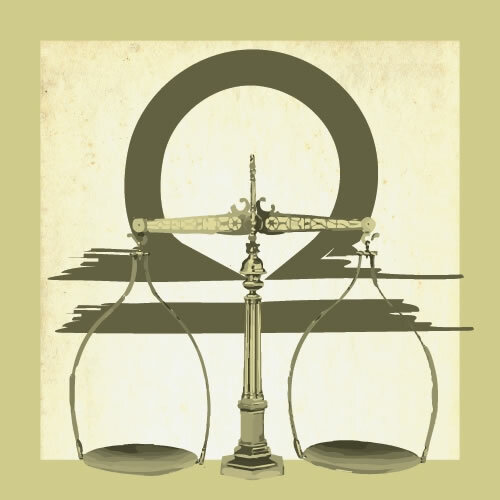 Libra (Sep. 22-Oct. 23) -- Venus has turned to direct motion in your birth sign, and this will release a burst of energy into your awareness and your relationships. You've been holding back, or retreating inward, for many weeks now, and the tide has suddenly turned. This release of energy will come with some surprises, so be open to what comes, and see the benefits of the changes that come your way. You appreciate and even depend on stability, and it's been challenging to have so much lack of predictability in your personal affairs for so long. By now you've learned to take advantage of the kinds of jolts that used to irritate you. That all said, Venus direct, opposite Uranus in Aries, is an invitation to take some elements of your life in entirely new directions. This could range from a collaboration to a personal relationship; someone might give you an idea, or you may be headed to Cleveland and end up in Boston, where you would be wise to take advantage of exactly what your environment is offering you. Get your full Libra reading by Eric here. Scorpio (Oct. 23-Nov. 22) -- The Sun and Jupiter have entered your house of personal finances, which may have you feeling like you're in the chips. However, even if you're feeling as if you're abundant on cash, I suggest you dial back your spending and pay close attention to the numbers. If you're planning holiday shopping, save that for until well after Mercury goes direct on Dec. 6, or you could end up wasting a lot of money. When Mercury is retrograde in a financial sector of your chart, restrict purchasing to what is necessary, and what is helpful, stopping short of making investments or spending on luxuries. Note that Mars has entered Pisces, which is another one of those cautions against spending too much. With that particular transit, though, you are reminded that the best things in life really are free. In the end, nobody cares how much your dress costs. It's you they're interested in, and at the moment you are especially appealing. 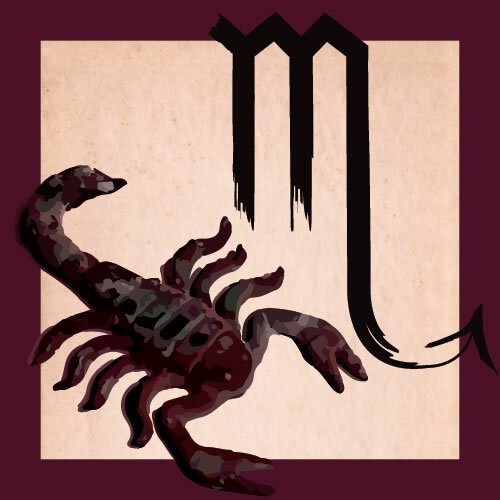 Get your full Scorpio reading by Eric here. 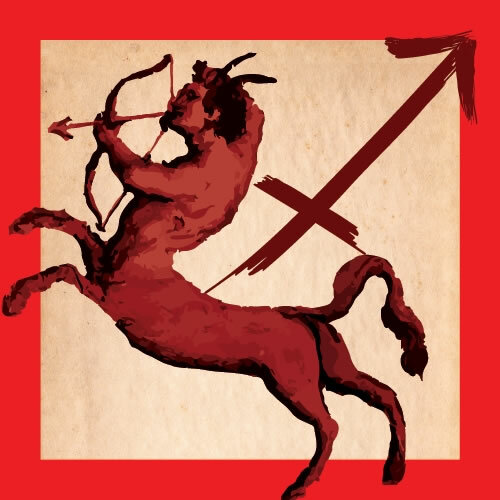 Sagittarius (Nov. 22-Dec. 22) -- You must be feeling a lot better with Jupiter in your birth sign. Definitely take advantage of your raised spirits and improved energy, though maintain a practice of being realistic. Or perhaps initiate one. You could be overrun by optimism, which on some days is a virtue, but which ultimately does not pay well, in a world where so much can go wrong. Therefore, keep a positive attitude, but strive to pre-empt problems before they arise, rather than wishing them out of your awareness. Troubleshoot whenever something seems to go even a little sideways. You're under the influence and protection of Jupiter. Yet there are other influences that demand your focus and attention, and caution against letting anything go too far out of control. This week in particular, pay close attention to the veracity of what you say, and what others say. Be meticulous about making any commitments that you cannot keep, or that can wait until a less hectic time. Stick to the basics. Get your full Sagittarius reading by Eric here. 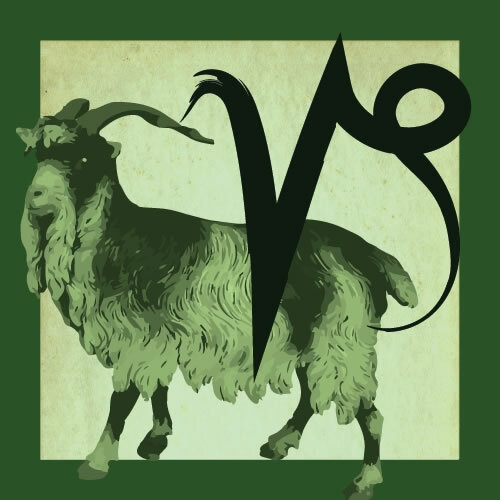 Capricorn (Dec. 22-Jan. 20) -- You may have a renewed feeling that anything is possible. It is, though in your world at the moment, this is more like building with brick and mortar rather than code and pixels. Even if you're involved in some kind of digital construction project, think of it more in terms of the physical world: something with tangible use, durability and a long-term vision. At the moment, the thing to watch is how you develop and play out your business strategy, as well as your relationship to people in power. Beware of any tendency in the direction of daddy pleasing or kissing up to people. There are better, more solid ways to establish common ground. One of them is standing up for yourself and giving your true opinion, without dripping with emotion. You will have plenty of energy to take on the world if you set aside the fight with yourself. It's easier than you might think; the most significant motive is wanting to get something essential started, or finished. Get your full Capricorn reading by Eric here. 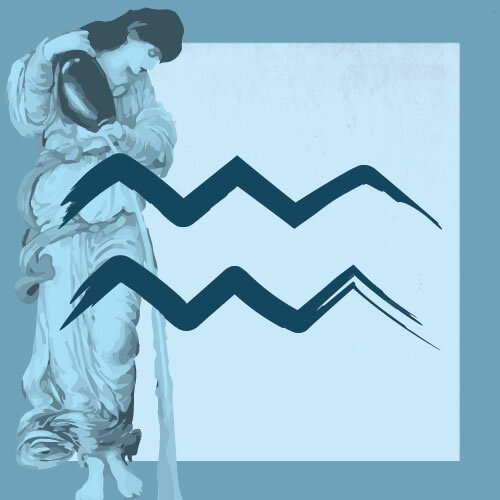 Aquarius (Jan. 20-Feb. 19) -- Mars has finally made its way out of your sign, after spending longer there than it has any time in the past 47 years. For many born under your sign, or your Moon or rising sign, the Mars retrograde of 2018 was a once-in-a-lifetime experience, for which I am sure you're grateful. Mars has moved onto Pisces, though I'm going to keep reminding you to account for the ways you've grown and changed, lost and gained. You now get to move on to new adventures. One takeaway from Mars retrograde is that you must always be grounded in your deepest values. This can, at times, be a source of seeming conflict for you, though in truth, that translates to the work you're doing around your self-esteem. What is meaningful to you must be allowed to express its meaning through you. As you do that, you will clear out layers of negative conditioning and express your clear ideas and intentions. Get your full Aquarius reading by Eric here. 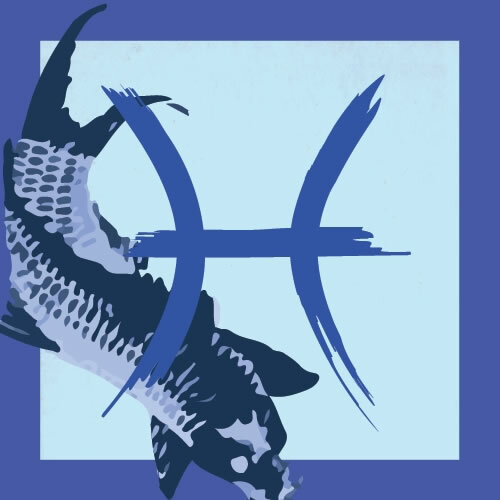 Pisces (Feb. 19-March 20) -- With the Sun and Jupiter crossing the midheaven angle of your solar chart, this is the time to aspire to great things. Yet it's essential that you pace yourself, and apply the principle of reduction to any process of expansion. That is, before you aspire to do more, it will help if you aspire to do less. Jupiter's presence can give you the feeling that anything is possible -- and it is, under the right conditions. Your main necessity, therefore, is to work with your environment to make sure that conditions are supportive of what you want to accomplish. This preparation and alignment with your environment is more important than the work itself, because it's what makes the work possible. If you want to sail a boat on the ocean, you must know your vessel, and you must understand the sea, the tides and the weather. One is not useful without the other. In these weeks of Mercury retrograde, emphasize understanding your surroundings, aspire to do less, and allow your true intentions to rise to the surface. Get your full Pisces reading by Eric here. Copyright © 2018 by Planet Waves, Inc. All Rights Reserved. Other copyrights may apply.